In the last post, I shared how you can calculate the amount you need to save for retirement. For many people, the number revealed by completing the retirement nest-egg calculation leads to an "Oh Crap" Moment, but it is usually easier to achieve than one would initially think. Introducing another great tool available via the "TOOLS" link at the top of the page … the Investment Value Calculator. In the previous post, I calculated that one would need $3,699,458 to receive the equivalent of $75,000 per year upon retirement in 35 years. The immediate next question is "How much do I need to invest each month to achieve $3,699,458 in 35 years?" Using the Investment Value Calculator, I can quickly calculate the number. If one has not started investing, then $575 needs to be invested every single month with an annual return of 12% to achieve the goal. Isn't that cool? I LOVE this stuff! For just $6,900 per year, one can ensure a secure non-Social Security-reliance retirement! In the next post, I will be sharing about another tool that shows you how extra money toward your mortgage each month reduces the life of that mortgage! 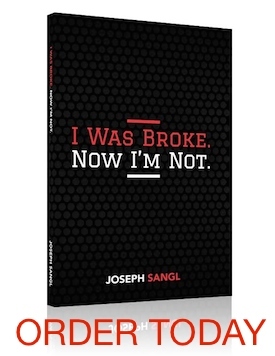 My first book, "I Was Broke. Now I'm Not. ", was released on January 20th. It is available via PAYPAL or AMAZON.